A pregnant guinea pig can be a source of worry for even the most laid-back pet owner. The stress pregnancy puts on a sow can lead to life-threatening health problems, so you should never intentionally breed your pet. However, if you find yourself caring for a pregnant guinea pig, you can help the new mom through her delivery and give her support in the critical early days with her pups. Normally, a guinea pig will handle her own labor without any need for assistance. She will deliver her pups, clean them off, and bite off their umbilical cords. In the case of a large litter, however, your guinea pig may become too exhausted and overwhelmed to deal with all of her babies. In this case, you can help her by gently removing the birth sac from the pup's head and body with a soft, clean towel, and if necessary, cutting the umbilical cord with a pair of sterilized scissors. Rub the pup gently to make sure he is breathing and active, and then place him next to the mother. In the wild, a guinea pig mother will immediately attempt to clean up the area after her delivery. The goal is to leave no trace of her birth that could allow a predator to track her and her babies for an easy meal. Your guinea pig will eat the placentas of her pups, and she may consume any bloodstained or wet bedding left over from her delivery. You can help by removing the contaminated bedding, allowing her to focus on caring for the newborns. Some guinea pig mothers take to caring for pups naturally, while others may need some time to work out what to do with their babies. Once all pups are breathing and active, your best course of action is to avoid interfering in the process. It may take her some time to decide to tend to the pups, and attempting to force her to interact with them could cause problems. 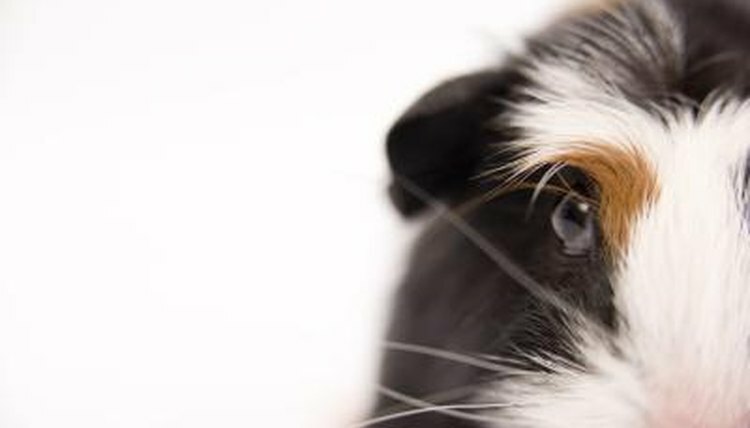 Baby guinea pigs are born with eyes open and able to eat solid food, so even if she does not begin nursing them right away, they should be able to survive until her maternal instincts kick in. Likewise, do not interfere if she seems to be overly rough while grooming her pups, because she is only trying to remove any leftover blood or fluids from their fur. You should only step in if the mother is biting or otherwise attacking the pups. Separate them and allow her to calm down before reintroducing the babies. Immediately after a delivery, a female guinea pig is exhausted and nutritionally deficient. Providing extra vegetables and treats can help her get her energy back, and may serve as the pups' first introduction to solid food. You should also provide alfalfa hay, which has extra calcium both the mother and the young guinea pigs will need.